If you’ve ever walked into a Sur La Table store, you know that it’s a place that you could lose yourself in… dreaming of perfect flaky pie crusts, fragrant simmering roasts, and piping hot espresso. Now imagine what it would be like to go to the Sur La Table headquarters – the heart of culinary equipment paradise, pulsing with amazing new products and ideas that will thrill and delight chefs of every level. 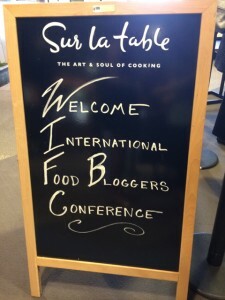 Happily, at the International Food Bloggers Conference (also known as #IFBC) in Seattle, we had a chance to do just that. On display in the Sur La Table test kitchen were a whole range of new products for fall, from the new slate gray color line of KitchenAid products (exclusive to Sur La Table), to a Himalayan salt block (you can grill on it and it imparts a nice salt flavor to your foods), to a sensor for your propane tank that gives you alerts on your smart phone when you’re low on propane (gadget geek alert!). 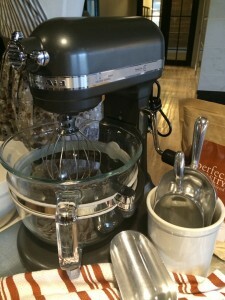 We also got a chance to gawk at (and try) the new KitchenAid food processor attachment that attaches to your KitchenAid stand mixer and slices, dices, and chops with ease. This food processor has six thickness settings and an extra-wide feed tube so you can get those hard-to-fit items like potatoes right into the spout. So what kinds of things can you make with this food processor, you ask? 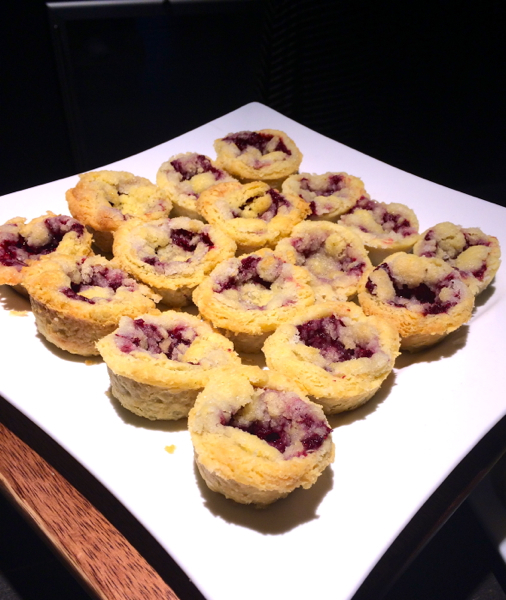 How about these incredibly delicious, crowd-pleasing Warm Cranberry Crumble Tarts? The recipe below is courtesy of Sur La Table. To prepare the tart dough: Place the flour, sugar, salt, and butter in the bowl of the food processor and run the machine until the mixture resembles fine breadcrumbs. Sprinkle in the water and run the machine until the mixture forms a ball round the blade. Turn out on to work surface and shape into a rectangle. Square the edges. Wrap in plastic wrap and chill for 30 minutes. 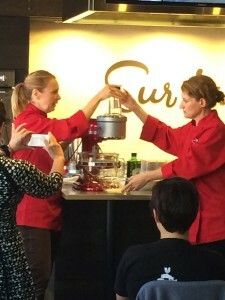 To prepare the topping: Place the flour, sugar, salt, and butter in the bowl of the food processor and pulse the machine until the butter is the size of small peas. 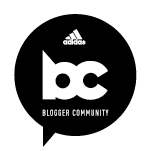 Do not overprocess. Set aside. To prepare the filling: Place the cranberries, sugar, orange zest, flour, and cinnamon in the bowl of a food processor. Pulse a few times to coarsely chop the cranberries. Set aside. To assemble tarts: Preheat the oven to 350 degrees and position an oven rack in the center. Lightly flour work surface or marble pastry board and roll pastry out to a 9-inch square and 1/8-inch thick. Using a 2 3/4-inch cutter, cut out 9 rounds. Stack trimming on top of each other (do not squash together, and roll out into a rectangle 9 inches by 3 inches. Cut out three more rounds. Use to line each hole of a 12-hole mini muffin pan. Press pastry gently into the base. Add 1 T. of the filling to each pastry case, pressing down gently with the back of a spoon. Scoop a tablespoonful of topping on top of each filling. Bake the tarts in the preheated oven for 20 to 22 minutes, until the fruit is soft and bubbling and the topping is golden brown. Allow to cool in tin for 5 minutes, then transfer to a cooling rack using a small offset spatula. Cool for 10 minutes before serving. Storing: The tarts keep for 1 day at room temperature. For longer storage, arrange in a single layer in a tub, cover with plastic wrap, and refrigerate for up to 3 days. Reheat in a 350 degree oven for 5 to 7 minutes. Did we mention that Sur La Table has more than 2,000 new products for fall? Check it out by visiting Sur La Table and clicking on the “What’s New” tab. Fabulous recipe. I am thrilled to know that there is a sensor for your propane tank that gives you alerts on your smart phone when you’re low on propane! I need one of those.